The SpeechMike Premium takes dictation to a new level. May it be the free-floating studio quality Precision Microphone, a microphone grille with optimized structure, builtin noise-reduction pop filter or the antimicrobial surface. 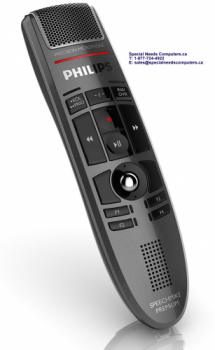 With four freely configurable function buttons placed at the lower area of the control panel, the SpeechMike Premium can be further personalized for any user and application. Work the way you want – a benefit that only a Philips SpeechMike offers. The SpeechMike Premium includes a built-in highprecision stainless steel trackball. Self lubricated and abrasive resistant Teflon bearings guarantee a smooth operation over the entire lifetime. In combination with a laser scanner and self-cleaning features, the trackball is as precise and durable as never before. On top of that, the trackball can even be taken out of the device for cleaning, if this should ever be required. 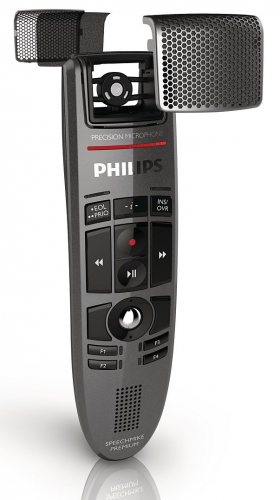 Philips is the creator of the ergonomic zones design. SpeechMike Premium has been tested and proven by users to have the most comfortable fit in the human hand. The dictation zone is optimized to keep thumb movement to a minimum. The buttons needed for the actual dictation functions are placed centrally, in the area most convenient for the thumb, guaranteeing perfect ergonomics and nonfatiguing usage for the user. Less frequently needed function buttons are clearly arranged above and below. All buttons used are formed to give as much tactile feedback as possible. Compatible with: Citrix, Windows Terminal S.